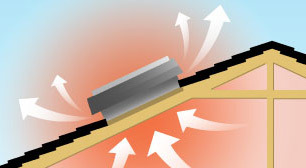 Solar attic fans work on a very simple principle: circulate the hot air out and get the cooler air in. They work harder when you need them the most, operating faster and moving more air when the sun is most intense. In doing so, they lower the load on your air conditioning equipment and prevent mold and humidity in the attic by removing moisture build up when circulating the air. The best part? They operate cost-free using only the power of the sun and include a lifetime warranty. We recommend solar fans because they cost less over time and are more reliable. The cheap, wired attic fans burn out after about 5 years and will need to be replaced. For the rest of the time you don't even know it's not working because you probably don't spend much time in your attics. 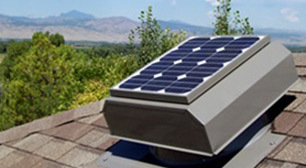 By comparison, a good solar attic fan will last 20-25 years and has a lifetime warranty. When you include the 30% tax credit, the expected payback period is 4-5 years depending on the state of your home. My air conditioning comes on about half as often as it did before I had the solar‑powered turbines added. Licensed & Insured Energy & Comfort Experts with over 15 Years of Cooling and Heating Experience. Copyright Â© 2011, Energy Guys, Llc.